It’s easy when you’ve been drawing comics for several years to forget how much things that have become a matter of routine to me are a mysterious and arcane process to people that don’t do this kind of thing. Or even if it’s not all that mysterious, I know I love seeing other artists’ creative process, so here’s a peek into mine. I’m lucky enough to get to draw the covers for my run on Young Justice. I drew a number of covers during my run on The Batman Strikes, but I didn’t get to do it every month, so I appreciate getting to do all the covers on Young Justice. Covers are actually done in advance of the interior art as they’re needed earlier than the interiors for the solicitations that are sent out to retails and the general public for upcoming issues. So not only are the covers drawn before the interior art is done, but sometimes I haven’t seen the script yet and only have a story outline or a suggestion of what might make a good cover to work from. I started my run on Young Justice with issue #5, but the first thing I drew for the book was the cover for issue #7 working two issues ahead. 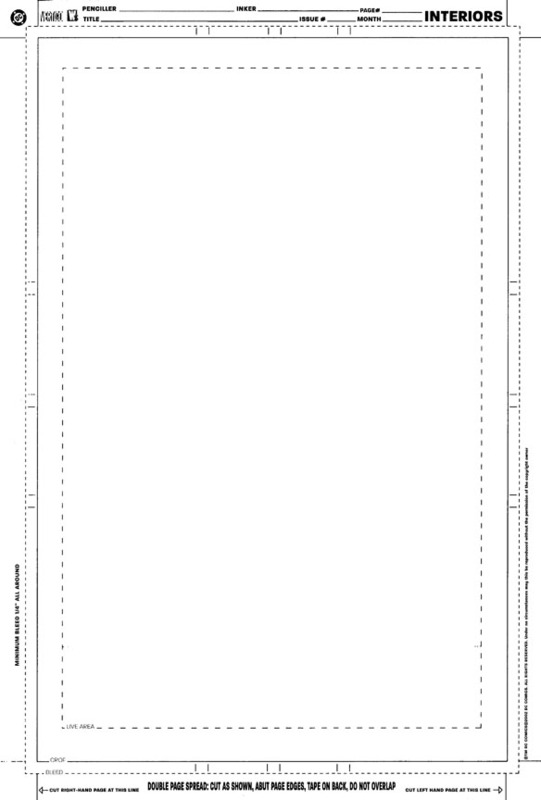 Comic art is done larger than the size of a printed comic, and publishers like DC and Marvel tend to prefer that artists work on art paper they have pre-printed with the standards margins and blanks for the tracking information for all the art they deal with every month. This is a bit of a holdover from the days wen all art was physically submitted to DC where it was processed in-house to eventually go to the printer. These days more and more of the artwork is sent the the publisher in the form of a digital file, formatted to rigid specifications. Here’s a sample of what DC’s art paper looks like. The art board is a bristol art paper measuring 11×17, and once the margins you can see here are taken into account the image area is slightly smaller. The lines you see here are actually printed on the art paper in “non-reproducing blue” to make it easier to separate the pre-printed lines out from the art that will be drawn on it. When planning a cover I like to know the general area that will be occupied by the masthead and logos so I can allow for those elements in the composition. Any background in your image will need to cover the entire image area, but you need to make sure the important elements of your design – like main characters – won’t be obscured by these overlaid elements. In Photoshop I’ve overlaid a scan of an earlier cover from the series to scale with the guidelines on the art paper. I’ve also included the UPC code here. The UPC code can move around, but it will appear in one of the lower corners of the book, either vertically or horizontally, so it’s a good idea to allow room for it. Similarly, most comic book covers will credit the creative team of the book, so it’s good to allow for that, too. This all gives me an idea of the space I have to work with so it was time to start drawing. I knew that Young Justice #7 was part 1 of a 2-parter focusing on the back-story of Artemis, and chronicling the events that led up to her introduction to the team as seen in the TV show. 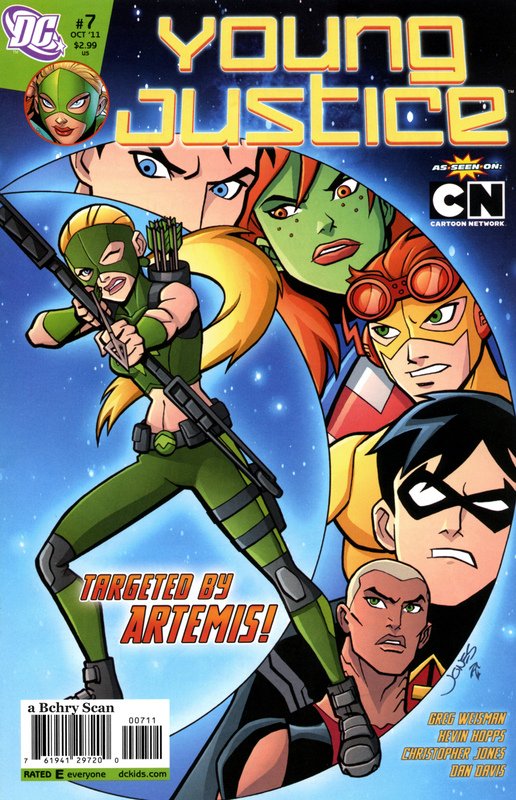 The story showed her dealing with drama at home in her civilian identity, foiling a robbery in her super-heroine archer guise (after a fake-out making it look like she was the one committing the robbery), and a montage of additional crime-fighting, before finally she arrives upon a battle between her future teammates and the android Amazo as seen in an episode of the TV show. I really didn’t want to use any of the imagery from the Amazo battle on this cover, even though it was action involving the rest of the Young Justice team, as I hate it when covers feature action from the past act of a story. It always feels like you’re giving away the ending when you do that, and given that this ended on a cliffhanger, it seemed like referencing that sequence would be a kind of bait and switch, teasing you with a situation that wouldn’t be resolved until the following issue. Editors often like to see multiple sketches so they have some choices for what cover concept they choose. Here are the three cover sketches I submitted, trying to evoke the elements I knew from the story in tantalizing ways. I liked the first sketch as it showed the existing members of the team symbolically looking with some wariness at this new character, framed in a crescent that mirrors the arc of Artemis’ bow. I liked this especially because the pose and the crescent moon imagery evoked the mythical Artemis from whom this character takes her name. The second sketch was a more dynamic view of Artemis as she prepares to fire an arrow in our direction, apparently at the shopkeeper with an open till – specifically referencing the scene from the story wither Artemis foils a robbery in progress (the actual bad guys are behind the counter and the shopkeeper). The third sketch shows the tension between the drama Artemis was facing at home and the dangers she was facing on the street in her costumed persona. I didn’t think it was likely that #3 would be the one, but it was another option to offer my editor. In the case of Young Justice, the editor is Jim Chadwick. Cover designs are approved by DC Comics VP of Art Direction and Design Mark Chiarello. Additionally, the co-writer of the book is Greg Weisman, who is senior writer and producer on the animated TV show upon which Young Justice is based, so he has a little more involvement with the production of the title than another writer might. So all these folks get input on this, but the decision came down to me from editor Jim Chadwick – use the overall design from sketch 1, but turn Artemis to face us so we aren’t seeing her in profile. I was a little disappointed by this, as I liked having the curve of her bow echo the crescent moon shape, but this certainly still worked. On to pencils! 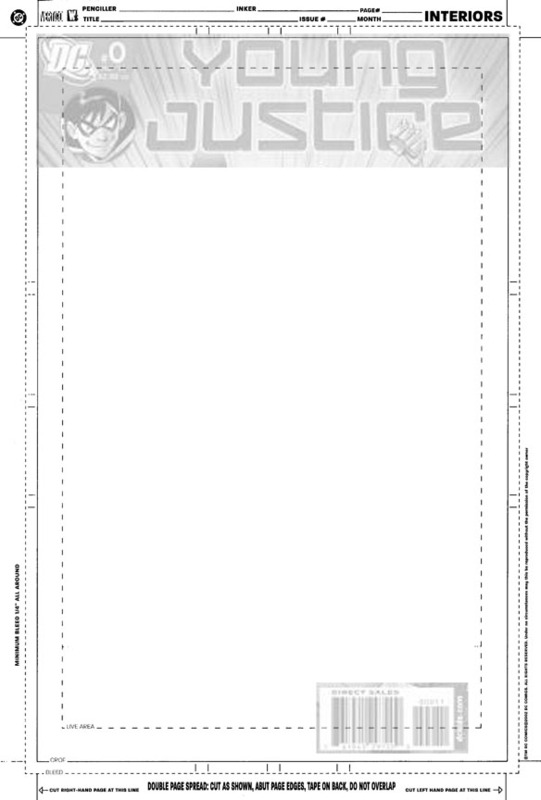 The cover is drawn in pencil on the DC art paper, and as is typical of most art in comics, it needs to be approved by the editor before the art is inked. Thankfully modern technology allows me to scan the pencils and send an image file via email for approval. Often the penciling the inking is done by two different artists, but in this case I was inking the art myself. The art gets scanned again, this time at a higher resolution. The artwork is scaled and placed on a template used by DC for all standard comic book art so everything stays perfectly uniform. The artwork is then uploaded to an FTP site so that once the art is approved DC can forward the digital file to a colorist who will ad color digitally as well. The original artwork remains in black and white and never has to be sent to DC Comics at all. In the case of this cover, the color was provided by Zac Atkinson, who has been the regular colorist on my run on Young Justice so far. Here’s what he did with the line art for this one. Nice, huh? Finally, here’s what the cover looks like with those logos and other elements I was trying to plan for. And there you have it! I’ll be doing more breakdowns of the process of creating these covers in the future, but for now a lot of the preliminary cover sketches and subsequent stages of artwork are already up in my gallery.